Band clockwise from bottom right. Last updated Sunday, 3 February 2019 at 19:31:43. First submitted Sunday, 3 February 2019 at 19:14:21 by Jason W Hughes. 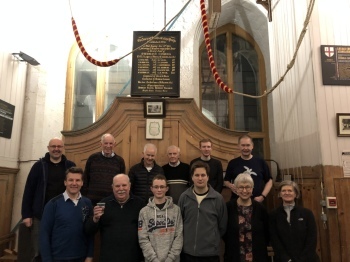 Sent for publication in The Ringing World on Sunday, 3 February 2019 at 21:19:04, and printed in one of issues 5627 or 5628. This performance has been viewed 1235 times.